The brilliant and ruthless General Wu Shang led the Emperor’s armies to victory after victory, but his heart was empty. One day he rose from his tent, stripped off his finery, and walked away from war and power. Penniless and in rags, Wu Shang came to a monastery. The monks took him in and he took up the Way of peace, discipline, and martial arts. 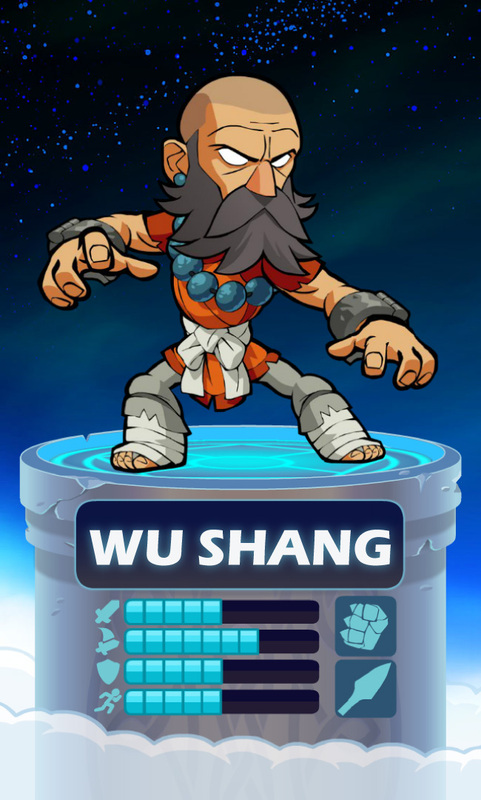 As his mind grew clear, Wu Shang realized he didn’t need to kill. When the angry Emperor sent his agents to attack the temple. Wu Shang defeated a company of Imperial soldiers without hurting a hair on their heads. To protect the monastery, Wu Shang took up a life of wandering, honing the soft powers of distraction and influence. He once concealed a hundred villagers in a single willow tree. He sneaked into the palace stable and turned the emperor’s horse against him. He hid a bridge from an advancing army. Having looked for Enlightenment in every corner of the world, Wu Shang let himself be captured. The Emperor’s men shackled him deep inside a volcano. There in the dark, Wu Shang breathed in the silent energy of the mountain. His inner eye opened, and he found peace. Projecting himself outward and away, he wandered the Astral plane until a Valkyrie led him to Valhalla. Wu Shang follows the Way in Valhalla, and is delighted to find he can fight without killing. Kor is teaching him to move platforms.